Immediately once we opened the packaging we could see this was well made and a beautiful piece of kit. Already set up, all you need to do is attach the the handle and set the speed on the back wheels. I loved this feature as Henry is at that stage where he tries to walk along with everything but a lot of walkers are just too quick and run away from him meaning that he ends up face planting the floor!! With this, it stays at a constant speed for him meaning he can toddle around with confidence. As a bit of a dub head, hubby approved too and I have to say the attention to detail is second to none. It looks like a real little beetle and I love the bold red colour. There are two positions you can set the handle at so when they are fully walking and using it as a toy it can move position to accomodate that; we’re not quite there yet though! It doesn’t come with bricks but they are cheap and easy to pick up. We had a box already that we just added, similar to these if you wanted to do the same. However, Darcie has also enjoyed taking her dolls around for a little spin in the car! The Hape walker VW Beetle Walker Wooden currently retails at £48.53 on Amazon but you can also find it along with the entire range on the Hape Website. We are very lucky in that we are asked to review some amazing products but Henry absolutely loves this. He is so proud as he walks up and down time and time again. The little break on the back wheels has been perfect and I think really sets this apart from others on the market. Well made, with beautiful and bold colours I really couldn’t recommend this enough. It would be a perfect first birthday present or Christmas gift for any little ones that aren’t quite walking yet. DISCLOSURE: I was provided with this item in return for my honest review. As always, all opinions expressed in this post are my own. This post may also include affiliate links. This has no effect on you but means that should you purchase an item under an affiliate program, I may earn a small commission. What a gorgeous, funky walker! 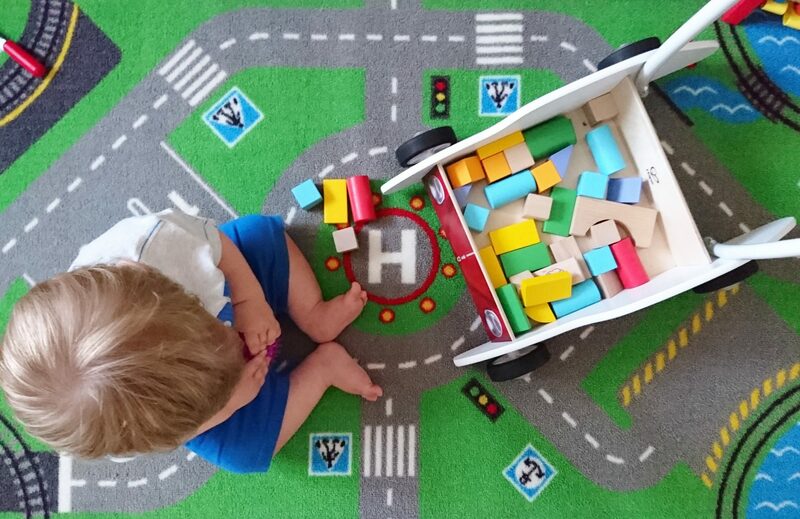 I love the Hape range – it’s so well made and affordable.